Blackberry 8703 Pictures | BlackBerry Blast! 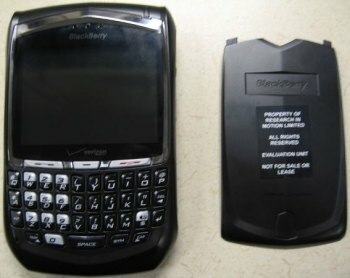 Pictures have surfaced in the PinStack forums of a rumored Blackberry 8703e, said to be offered soon by Verizon. The rumor is that Verizon will debut the device on August 28, 2006. The posting indicates that the 8703e will support CDMA and GSM. Would Verizon be offering a GSM phone? It appears that the rumor is just a rumor and that in all likelihood the 8703e will support CDMA only.